I am a stupid amount behind on this blog; sorry. Work has been relatively stressless, but I can't blog at this job. The people are really great, though. Here's a painting I did for a coworker who is pregnant. Her baby's room has an aviation theme. 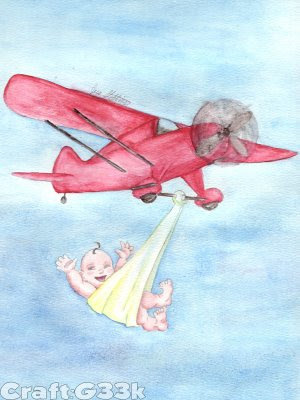 I would like to point out, for the record, that it is not a giant baby; it is a tiny plane. I've got a lot of Halloween crafts I want to show you. More later! I am holding a nursery pictures contest on my site until Jan 2009. Do you think your friend would like to enter her room? I would love to see it! She can win a $75 gift certificate from PinkTaffyDesigns and her baby's room will be featured on my home page.